“Breach of Peace” was conceived, photographed, assembled, edited, and in large part written by Eric Etheridge, who has now brought the skills honed as a journeyman editor at non-trivial publications—including The Nation, Harper’s, Rolling Stone, Seven Days, George, and, currently, the Times—to bear on his own creation. Flipping through the coming weekend’s Book Review, you’ll find a quadrant of faces — two pairs, each featuring a mug shot and a present-day photograph. 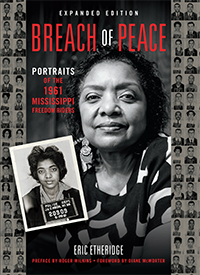 The images are from “Breach of Peace: Portraits of the 1961 Mississippi Freedom Riders,” by Eric Etheridge (Atlas, $45), a book chronicling a remarkable moment in civil rights history that merits a few more words than the 30 we were able to give it in print. Five years ago, Eric Etheridge stumbled across the mug shots of approximately 320 Freedom Riders who had been arrested in Mississippi in 1961. The Freedom Riders were hundreds of people — black and white, men and women — who gathered in Jackson, Miss., to challenge the state’s segregation laws.